You can build out the equivilent to pfSense’s C2758 (less the support contract) for less than $800 using the same SuperMico case/motherboard they use (http://www.supermicro.com/products/system/1U/5018/SYS-5018A-FTN4.cfm), which has four onboard ethernet ports and a PCI-E slot. I am currently using my laptop (Sony VAIO Pro, i5, 4GB RAM) as my desktop for coding. I am currently based overseas for 12 months and was looking for something a little beefier. The main bottle neck is memory (running Visual Studio and SQL Server). My Chrome tabs have to reload when I switch tabs and the disk can thrash (even though it is fast, SSD PCI-E) when compiling etc. Upgrade my laptop ($2000 AUD for something like a Dell XPS 13) But my laptop is fast enough to do laptop stuff…feels a bit early for an upgrade. Get a decent NUC, around $1200 configured. Get one of these, around $600. For the price, seems like it may be a good option, shame it can’t fit the faster SSD’s though. Get one of these, around $600. Why do you say $600? I only paid $340 for a fairly substantial AliExpress Broadwell fanless model (128GB SSD, 16GB RAM). Are you referring to a different currency than USD? As you can see, I think putting a shelf immediately under these computers is a good idea, as the power brick presents cable routing issues. With the shelf underneath you can tie up the excess cord and plop the power brick on the shelf directly under each one. I also superglued a cheap button cover over the power button since Linux will happily power all the way down as soon as the front power button is nudged, even accidentally. I am sure this can be configured in software, but these little boxes are running important bits of our infrastructure and it should be hard to accidentally power them down, not easy! Has anyone found a source for those machines in the US? A host machine running Windows 8.1 with Media Center, always on to record shows. It seems like one of these scooter computers could very likely replace both of those host machines, and run Windows 8.1 with Media Center to still record/playback shows, and use Hyper-V to host the VMs, and use a lot less electricity. I would probably need to add a larger secondary drive (for redundancy/storage). Am I completely crazy for thinking one of these might work? Jeff, thanks for sharing. After you emphasized the age of pSense hardware a couple of weeks ago, I ended up waiting for one of these to arrive from China before selling my SG-2220. I had been really reluctant about my first AliExpress purchase, with some impatience factoring in, but it was well worth the wait, and I’ve ordered a second since. For those thinking about pfSense, I had a lot of problems with pfSense not working with various Steam games (multiple kids trying to jump into the same game), even after some suggested NAT settings tweaks. I made a switch to ClearOS, at least for now, and it all just worked with no tweaks required. ClearOS seems a little dumbed-down, so Ubuntu Server may be a better choice. Just wanted to clear that up for anyone else looking into these units. Interesting it looks like you are right! There is also a newer Phison S10 controller which performs a bit better too. Left is the S10, right is the S9. My PC currently has a 3.5" HDD (WD 2GB Green - WD20EARS) which I’d like to use with this computer as a secondary drive. I realize I won’t be able to get it inside the case, but is it possible to set it outside the case, and somehow get a SATA+power cable to it? Would this PC provide enough power for this HDD? Interesting! I was really confused for a second until I realized CyrystalDiskMark had things listed in a different order between the two controllers. Looks like a pretty decent improvement. I don’t know if I will ever stop being amazed how small and fast these things are getting, and at reasonable prices, too. I doubt you could use a 3.5" HDD because the SATA power adapter included only has red and black conductors (5v). The yellow 12v lead and its ground aren’t present. Big increase in buffered reads (2x), small increase in cached reads and copy (1.15x). 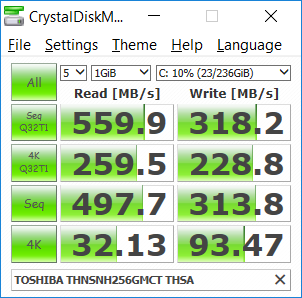 edit: the Phison S10 controller is de-facto compared here as the Corsair Neutron XT (reviewed at AnandTech, StorageReview) to a bunch of other SSDs http://www.storagereview.com/crucial_mx200_ssd_review – mostly it does OK and is solidly middle of the pack (which is great, actually, versus cost) but on file server and database server tests it stumbles badly. Just a quick note on ordering machines these from eGlobal via AliExpress - I ordered three identical units of a slightly upgraded model (barebones i7 5500u), and the machines experienced sudden power-off without warning 20-30 minutes into the stability test protocol under either Mprime or MemTest86+. Support was great: it ended up being a BIOS issue, and they supplied updated binaries. After flashing the BIOS, all three machines are rock solid. Definitely run a stability test if you purchase these sorts of machines - it’ll save a lot of hassle if you intend to use them in a production environment. There’s an 3rd slot for SSD, marked as something with “pcie” (the unlabeld purple square in the OP MB picture). Presumably, it’s for “Mini SATA PCI-e” parts, whatever that is. OS: The machine came with a preinstalled Windows 10 Enterprise - probably pirated, with some Chinese-language homepage and links. I proceeded to nuke it from orbit, of course. Stability: At first, the machine would hang after a few minutes of operation, including after the first boot of a blank Windows 10 installation. However, after I changed some BIOS settings (disabled a bunch of stuff I recognized as not needed), it’s been stable, including an overnight Prime95 run. Description: The speed of processor 0 in group 0 is being limited by system firmware. The processor has been in this reduced performance state for 71 seconds since the last report. The HDMI output caused overscan on my LG TV, which I fixed with this. would one of these (specced with 16GB RAM and a 128GB SSD) be up to the challenge of email, internet browsing and general office document work? if i wanted to add a 2.5" SSD as well, i assume that all i would need to add is four motherboard mounting screws for the SSD?